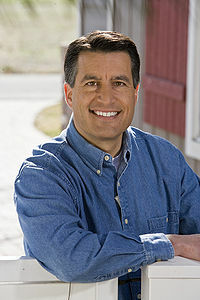 Brian Edward Sandoval (born August 5, 1963) is the 30th and current Governor of Nevada. Sandoval is a Republican, and he has held office since January 3, 2011, replacing the Republican incumbent Jim Gibbons. He was elected during tough economic times on a platform that he would not raise taxes. Sandoval received his Bachelor of Arts degree from the University of Nevada in 1986 and his law degree from The Ohio State University Moritz College of Law in 1989. He was the first Hispanic in Nevada to win a statewide election when he was elected attorney general. He also served as a federal judge for the District of Nevada and chairman of the Nevada Gaming Commission, the youngest person ever to do so. Sandoval's family is of Mexican ancestry. This page was last modified on 27 June 2016, at 19:20.